These botanic gardens are really amazing - on a large scale they seem to spread for miles, with huge trees, long sweeping lawns, and massed plantings in incredibly deep beds. The smaller scale things are equally amazing - tiny rockery plants, the fruit salad colours of the flowering primulas, the cherry manuka flowers on dark wood stems. The botanic gardens are full of twisting and turning paths - leading visitors to a huge water-lily pond ringed with giant Gunnera, or through New Zealand native bush and woodland to a bed of flaxes and hebes, or into picturesque enclosed wedding-venue lawns. Then there are the gardeners - masses of them, all stylishly clad in putty coloured shirts and shorts (I want one of these outfits - with an embroidered Moosey logo, naturally) with wheelbarrows full of shiny tools and cheap plastic buckets. The gentle river Avon (with Toe Toe and tussock-lined banks) flows gently throughout the grandeur, minding its own business. Then there are the huge exotic trees (elms, oaks, plane trees, many of which are over 100 years old) in the lawns, planted by important early settlers and the odd British prince. I had the garden reporter thing under control - honestly - until I tripped over the entrance to the old-fashioned rose garden and totally lost my journalistic balance. This is the most beautiful garden I have ever visited. 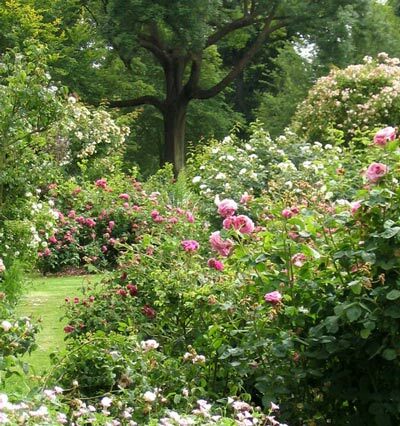 The rose beds are varied - some curved, some sharp and straight. There are old roses of every size and colour tumbling, climbing, drooping, flopping, dripping, spreading - and some just sitting still. 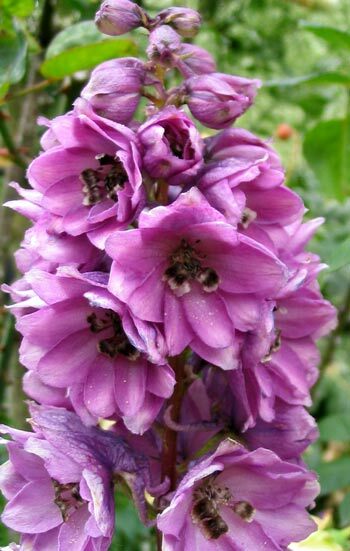 Every rose has small natural-looking perennial friends for company - delphiniums, peonies, salvias, himalayan poppies, just to mention a few. 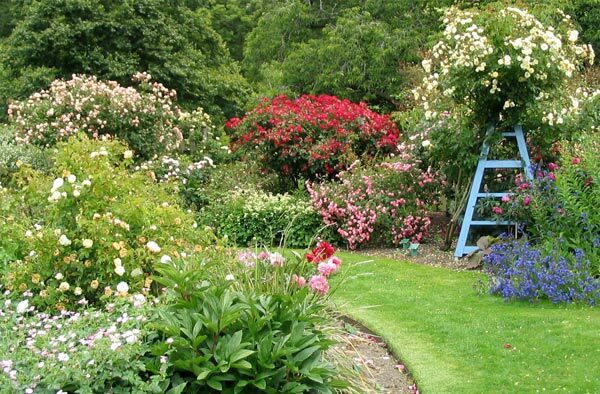 The companion plants look so much better than lavender rows and clumps of hostas - this is a real rose garden. All the plants go so well together - they look like a huge group of well-satisfied botanical friends having a giant garden party. I got completely caught up with the Empresses, the Ladies, and the Duchesses. I ran out of digital camera memory. I lost my garden reporter's confidence. What about the Perennial Border? I'm sure that this deserves a mention. And what about the fuschia collection? The fern house? 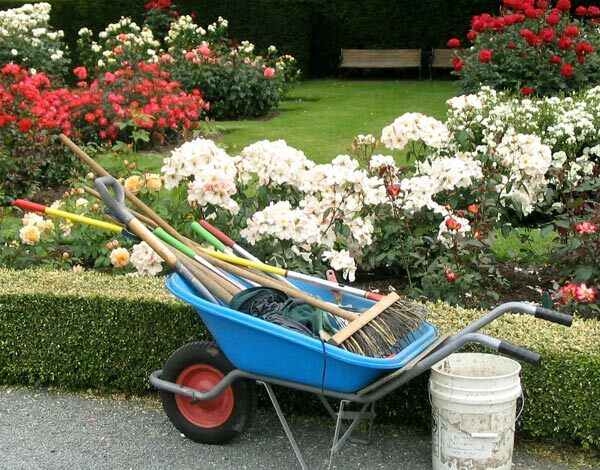 The modern rose garden? Eek! All these features simply got forgotten. 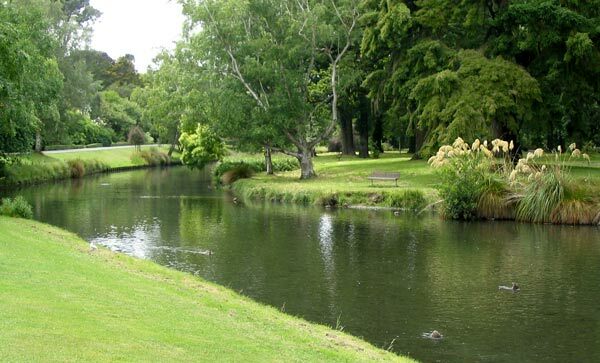 I just can't 'do' the Christchurch Botanic Gardens in one visit, in one article. Consider this my sincere attempt to introduce the Christchurch Botanic Gardens, early summer, December 2004.